Redlands #2 reveals the three ancient witches living and working among mortals in the Florida town. Alice, Ro, and Bridget lead seemingly normal lives but their secrets are at the mercy of a serial killer. It's a cat-and-mouse game that could expose the three detectives unless they find the killer first. After an explosive but mysterious first issue, issue two introduces and fleshes out the characters in significant ways. The three witches working as police detectives have their hands full with a serial killer that mocks them, calls them directly to taunt them, threatening to expose them. The witches are unfazed but cautious nonetheless. Alice seems the most concerned about bringing so much unwanted attention to the town. She drives the action and shows what being a witch is all about. That's all I can say about that. Jordie Bellaire has a knack for dialogue and even in the first issue, which was sort of a prelude to this but not overtly connected, the interactions between the characters made the story so riveting. The pacing this time is more deliberate and measured. Bellaire's ability to convey the arrogance of a killer over the phone is pitch-perfect and Vanesa Del Rey's sequential art projects as though a camera is swinging around the killer to reveal his face. It's eerie and chilling but not the only scene that will give you goosebumps. Again, I can't give it all away. 'Redlands' is emerging into a unique horror experience where you don't know exactly what will happen next. Bellaire and Del Rey are wringing every ounce of tension and suspense in every scene. The premise has unfolded with some unlikely protagonists, a charming but deadly antagonist, and one bloody twist after another. 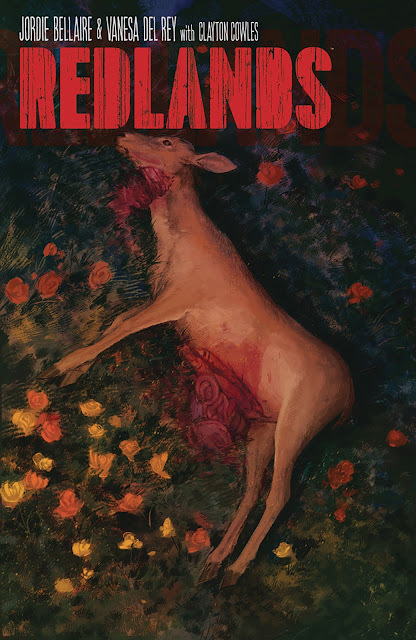 This is 'Charmed' meets 'Hannibal' which makes 'Redlands' a must-buy.